Long ago in a distant land, I, Aku… wait… let me start over. 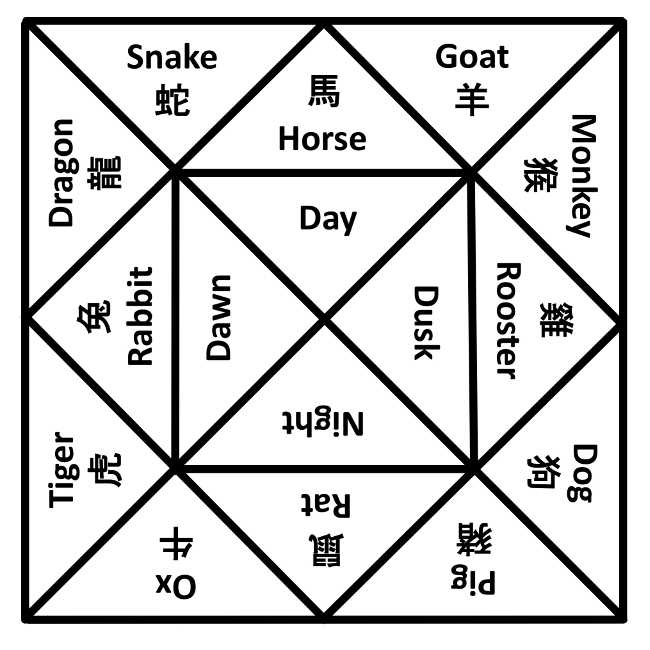 Long ago in China, the diurnal cycle of day, dusk, night, and dawn was divided into twelve two-hour hours and each hour was named after an animal in the Chinese Zodiac. The Hour of the Rat was from 11 P.M. to 1 A.M., and so on. These animals were also assigned directions: Rat being North, Ox being NNE, etc. Many are familiar with the animals having “years”, so if you were born in a certain animal’s year, you might have certain attributes. These twelve animals are certainly multi-purpose! This entry was posted on August 23, 2018 at 9:36 AM and is filed under fourfolds, sixteenfolds. You can follow any responses to this entry through the RSS 2.0 feed. You can leave a response, or trackback from your own site.